In the wake of backlash against other airlines for tightening restrictions on emotional support animals, a United Airlines passenger's dog died mid-flight early on Tuesday after a member of the flight crew reportedly insisted she keep the dog and its carrier in an overhead bin. As a report by The Points Guy explains, the dog was in an approved carrier, which was meant to be stored under a seat. However, the small dog was kept in the overhead space meant for luggage for the entirety of the flight. Passengers reportedly heard the dog barking throughout the flight, but after landing discovered that the animal died at some point during the trip. According to the policy on United's website: "A pet traveling in cabin must be carried in an approved hard-sided or soft-sided kennel. The kennel must fit completely under the seat in front of the customer and remain there at all times... A customer traveling with an in-cabin pet cannot be seated in the bulkhead or an emergency exit row." 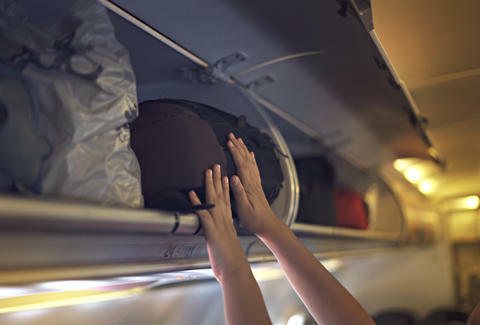 Overhead bins are not designed to circulate air, and it's possible that played a role in the animal's death. No official cause of death has been released, however, and the flight crew member's reasons for insisting it be kept in the overhead bin are unknown.